I had Friday through the weekend planned. Busy, but manageable, the fridge sorting had the meals taken care of and I had a timetable written up... What could possibly go wrong?! Friday saw D. and I ( unusually just the two of us), with all the equipment we needed to complete the new hen run. This needs to be finished so that I can put all the hens away, which in turn means that I can finish planting out. I have now completely run out of netting to protect the young plants from the hens and have all the beans, tomatoes, sweet corn and squashes still to put out. Firstly we had a rush of customers for eggs and Rhubarb. Some folk seem to want to discuss each egg, and can little Johnny look at the chicks please? FINALLY we get down to the jobs.. So I am cutting the front lawn, while D. is getting started. He comes into the front garden to ask if I can ""Just hold this" ( we've all been there haven't we?) and then says " Seems there's a swarm behind you" and indeed there was! Hive No. 3 had swarmed and was looking to settle into the "Sunset" Apple Tree. Sometimes a swarm settles for a very short time before it sets off again, often to be lost. So, with no time to lose we (figuratively) drop the lawns and the chicken run and get the bee gear out. Here is the swarm. Hope you can make it out. It turned out to be one of the easiest swarms to capture. We placed a spare brood box onto a dining chair ( just the right height) and after removing a few frames and putting a piece of cardboard as a bridge over the gap between trunk and box swept the swarm into the box. 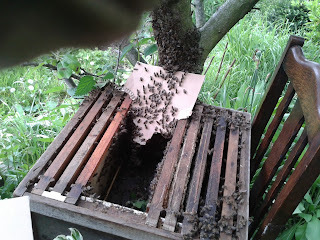 Within seconds it was clear that we had the queen in the box and the bees walked into the box. Here they are obligingly pouring in to join their queen. Within half an hour of this pic being taken the other frames were back in place, the lid was on and they were nicely settled. The downside is that I have temporarily lost a dining chair! I got the lawn finished and joined D. to do a spot of net stretching and pinning and witht he job still not finished, we finally settled in by 9.30 when YD arrived to cut her dad's hair. The plan for Saturday was to continue with the Hen Run. At 3.30 I was going to pick Adam up and drive over to Rugeley to pick up YGD where she had been staying with friends ( where she keeps her pony) deliver a couple of hens and bring Adam and YGD back here to stay the night. So. the phone rings, it's D's brother "Do you want some pallets? I've got 28 8ft by 4ft pallets here, which must be collected this weekend"
DOES MY HUSBAND WANT SOME PALLETS?.... IS THE POPE A CATHOLIC?!! So off we set and collected the first nine in the trailer, bring them home and stack them in the yard. Then off we go again with the hens in a cage in the back of the car and with the empty trailer and pick up Adam, drive over to Rugeley to pick up YGD, back to D's Bro. to pick up another 9 pallets. Back at ours it is now 7.30 and after some food and more pallet stacking, D sets off with Adam to collect the last 10 Pallets and I put the hens, lambs and YGD to bed. So another day when nothing has been done to the Hen Run!! Tomorrow, we take Adam home and then we will go on to a party for the afternoon and then we are meeting friends at night. D. estimates he has approx 3 hours to give to the hen run tomorrow.. Yeah Right !! Just realised what the time is. It IS tomorrow! I guess I should get some sleep, so night night all. I m impressed........I have never heard of anyone who can capture bees. 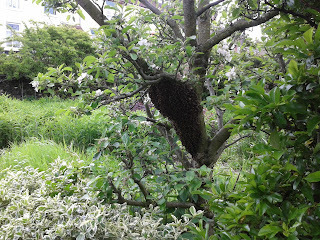 And, is nt it - " a swarm of bees in June is worth a silver spoon" ? You have reminded me about that rhyme A swarm in may is worth a load of hay..in June,worth a silver spoon..in July not worth a fly !! Had to remind myself of an earlier post about visitors and friends too! !